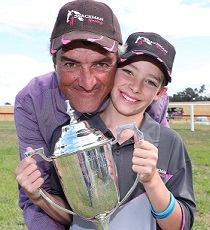 Scott Spackman and son Oliver celebrate Didn't Even Kiss Me's Tumbarumba Cup win. (Pic: Daily Advertiser). Progressive mare O’ So Hazy, along with last start winners Didn’t Even Kiss Me and Chastity Strikes give him confidence he has his best chance since the inaugural series to represent the Southern Districts in the Final at Randwick. 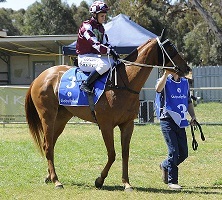 O' So Hazy is one of Scott Spackman's three Country Championships contender. (Pic: Bradley Photos).